Those of you that use the Project-GC website will be aware of the endless lists of statistics to be pored over, should numbers and lists and leader boards be your thing. I never thought stats were my ‘thing’, until I discovered this website. Now I find myself having a look at least a few times a week. The three I click on most are Profile Stats, Top Caching Streaks and Top FTF Streaks. Since the end of February sees me just tipping over the 200 days in my caching streak, that leader board is fun to watch, although the next nearest to me is 366 so I have a while to wait before I go up in the world in that regard. Top FTF Streaks is the number of consecutive months in which you’ve found an FTF. And this leader board is the main reason that I occasionally go out in my pyjamas or get up extremely early to chase FTFs. Project-GC monthly FTF streak – 10 months and counting! On 31st January, there were 8 new caches published at Curtlestown Wood in Enniskerry. Some of the caches were found that day, but two were not and on the evening of 31st January, a bonus cache was published too. A plan was made to meet Donnacha and silver soldier at the parking coordinates at 9am on Sunday, 1st February and to hopefully, nab at least one FTF on the first day of the month to keep the streak alive. Alas, it was not to be as the swerve had already found all three before we had even set off. 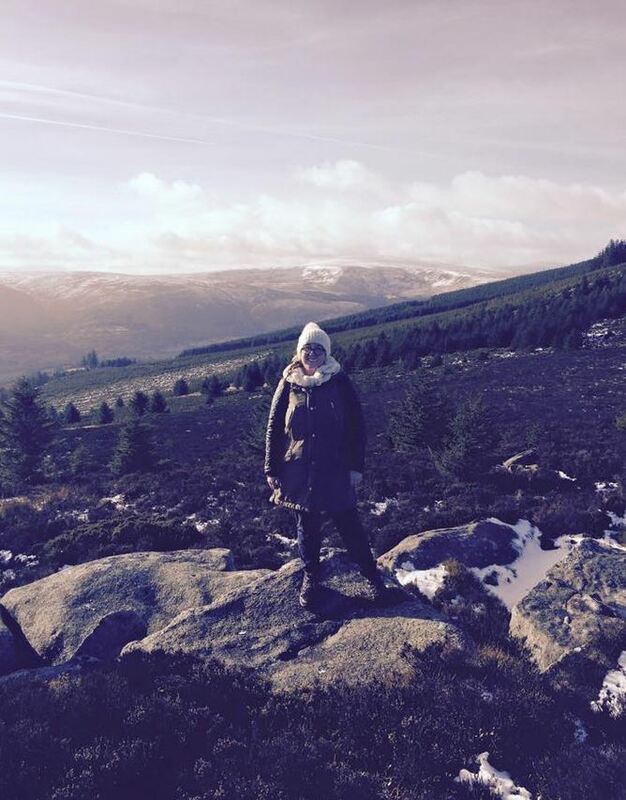 Regardless, we did this really nice series and I also found Ravens Rock (GC11MTD) which brings you to an amazing spot overlooking the Wicklow Mountains. The scenery was made even nicer with the snow lying on the ground and the sun splitting the skies. We even managed to find an unpublished, unfound cache as we made our way along the trails! A suspicious pile of rocks warranted further investigation and indeed, we found a cache. Afterwards, Donnacha did some research and discovered it had been published on OpenCaching.com the previous summer but was unfound as yet. As we were making our way back to the car having found the 10 caches we set out to do, another new cache notification was received for a cache just a few kilometres away so we picked up the pace and made our way there. Beaten again! This time by s2zero and missy1903. It was not to be that day. A few days later, on the 4th February, five new caches were published in the Dublin area. Three of them were in a park right beside my office, so I planned to get up extra early to try for those. Unfortunately for me, silver soldier went out late that night and nabbed all three. However, there were two others still up for grabs so I set my alarm extra early and headed out the door before 6am with my Garmin nüvi set for Tallaght and the fourth cache in the Love/Hate series: Love/Hate Series 04 – Tommy Shoots at Fran (GC5M0M1). I arrived at GZ at 6.25am and made the find within a few minutes. A good time to come here as the neighbouring pub was very much abandoned. It was still pitch black though and I managed to lose the lid of the container! Panic stations until I finally realised I had put it in my pocket, despite not having any recollection of doing so. At this point, it was only 6.30am so I decided to go for the other cache too WHAT LIVED IN A BARN LIKE THIS? (GC5M9NM). I hadn’t researched it thoroughly and it ended up being a lot further away than I thought but I was fully committed by the time I realised that so I ploughed on and managed to nab my second FTF of the morning! So I had done enough to keep my streak alive. With a trip to Belfast planned on 7th February, I noticed a puzzle cache not too far off my route: The Accidental Chef! (GC5M99Z). I started looking at it and managed to figure out what to do but didn’t have the resources to get the vital information needed to work out the final coordinates. I tried in vain for two days but couldn’t manage it so forgot about it until another Belfast trip was planned on 21st February. Amazingly, FTF was still available and this time, I managed to get what I needed and grabbed my third FTF of the month en route to Belfast. Now it’s almost March and the FTF chase starts again! Although this cache was very much a Did Not Attempt for me, it was certainly an adventure for all of us who met up in Skerries on 31st January. Donnacha, silver soldier, Blue Jay, Toffeeman and I met up in Skerries on a stormy Saturday with an island cache firmly in our sights. 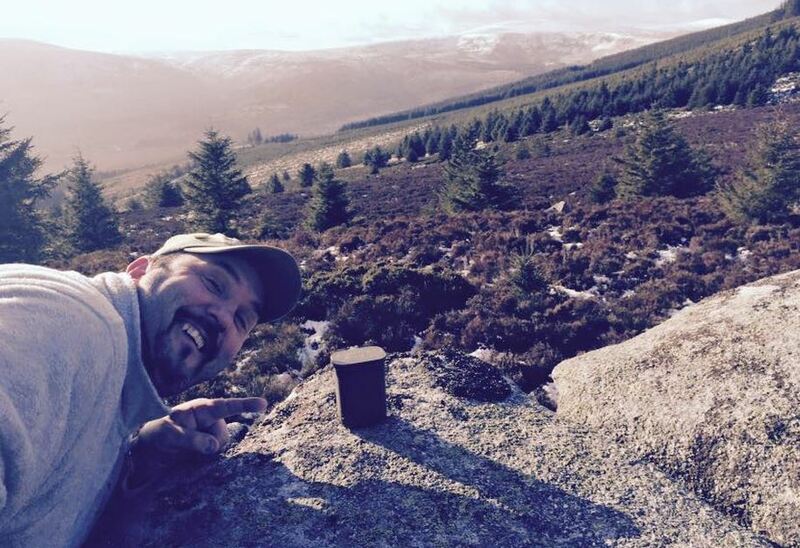 This cache qualified as a Lonely Log, having last been found in 2012. The plan was to walk out to the island at low tide. It didn’t work out that way on the day. Silver soldier started walking out ahead of us all, to assess the depth of the water, and one of the local residents was worried and decided to call the Coastguard, after which a representative from the RNLI promptly arrived to check everything was ok. He didn’t try to stop us from going over, but advised against it. The five of us wrapped up warm and donned wellies before starting the walk over. In the end, only Donnacha and silver soldier went over, as the water was just too high for the rest of us. 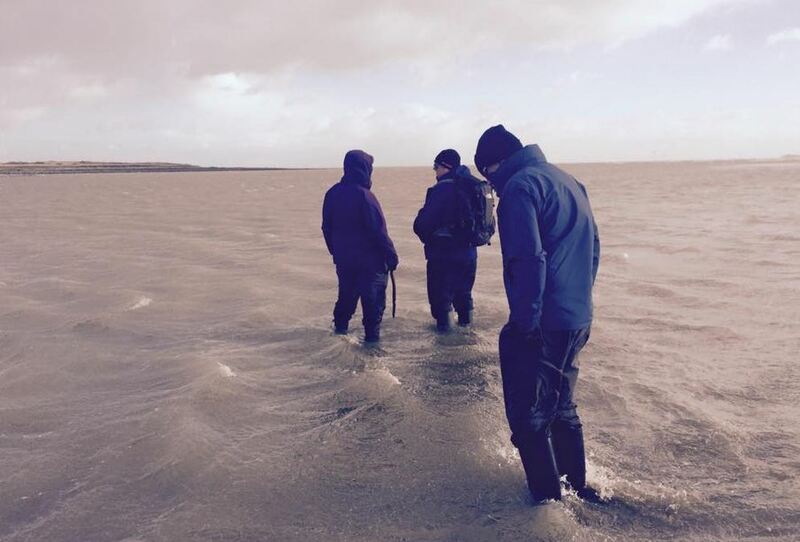 As the three of us were walking back, with water already in our wellies, we met the Coastguard who had come to check everything was ok. We advised the two guys wouldn’t be over there for long. 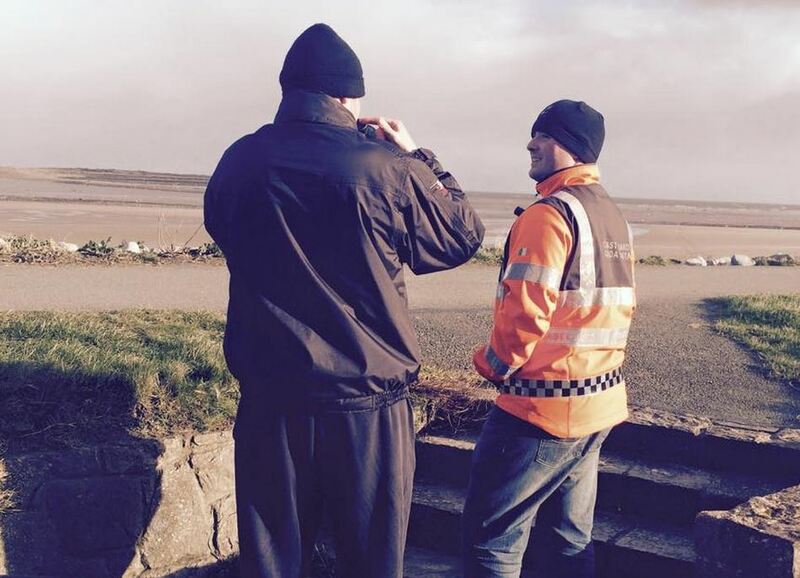 It’s reassuring that they reacted quickly to check everything was ok. A phonecall to Donnacha assured us they were making their way back, but the Coastguard stayed until they were back. Quite an adventure but fortunately, the helicopter didn’t need to be deployed on this occasion! Sounds like quite the adventure! I once was dropped off by boat to swim to a small island on a lake to find a cache. I didn’t bring the proper shoes and the mosquitoes were horrible! I was determined to find it though even with the pain. It turned out to be a great experience. Thanks for sharing your story! I think I’d have been in the group of those that went to find the cache. Whilst I don’t tend to do ‘extreme’ caches given my dislike of height (or more specifically falling from them), this would have been within the comfort zone and being that close, I wouldn’t have been able to turn down the opportunity to go grab. I too am a little obsessed with checking project GC although more the badge/belt aspect. I’m slowly working toward being a blue belt but there’s a little way to go yet. Maybe the 100 cache day I have planned for the spring will help? Ivan never really been an FTF hound, there are too many others around here that are more competitive in that regard than me. Typically you only get about 15 minutes around here which isn’t enough for me anyway. I’ve only ever had one when I happened to be passing as it was published and that didn’t show up on Project GC anyway, something to do with the tags in your log I think? I probably should try and fix it as I think it’s points towards that elusive blue belt! But, did they find the lonely cache? ?